(36o 28.801’N, 116o 51.398’W) The site is located on the west side of CA 190 just a mile north of the National Park Service Museum and Visitor Center, it is well marked and very popular as it is an easy walk or bike ride from Furnace Creek. Best Time: Morning, all year. Geology: For a few years in the early 1880’s, borax minerals were removed by hand from the playa surface and brought to this location for separation and processing. The borax was then loaded on to 20 mule team wagons and hauled south down the length of Death Valley, out through Wingate Wash and then across the northern Mojave Desert to the railhead in the town of Mojave. This quite inefficient operation stopped after only a few years because richer deposits were found near Barstow which was much closer to the railhead. 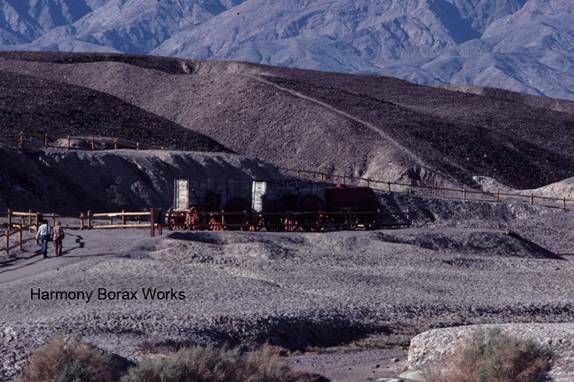 Borax mining returned to the Furnace Creek area in the 1920’s (Site FC4). The borax minerals on the playa have been derived from weathering of the Pliocene age Furnace Creek formation which comprises the gravel-capped low hills east of the site. The gravel capping the formation is a lag deposit. There are some faint Lake Manly shorelines on the low hill southwest of the Borax Works and raking marks and piles on the playa surface just beyond. The National Park Service’s Museum and Visitor Center is just south of here and is a must-see stop for anyone interested in the geology of Death Valley. Also, on the grounds of the Furnace Creek Ranch there is borax museum which is also worth a visit.